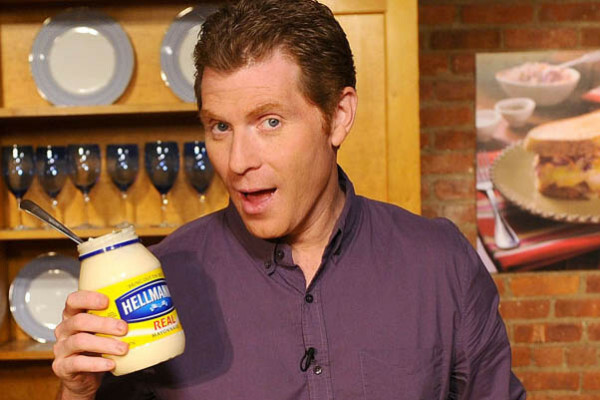 Celebrity chef Bobby Flay, known for his rockstar attitude with a Tex-Mex flair has been harboring a secret. LP: So, this is big for you Bobby, how are you feeling? BF: A little nervous, but it’s time. I already know I’m America’s favorite chef/divorceé/Throwdown superstar and I’m sure my mountains of fans will be supportive. BF: Well, readers of LADYPARTS. 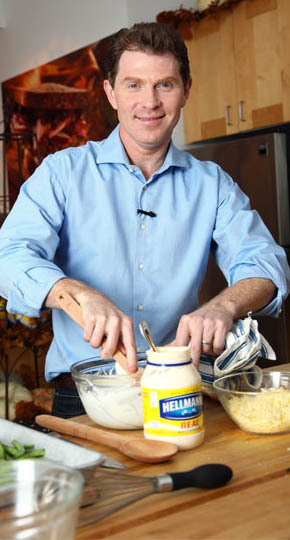 I only kind of like grilling, my real passion is…well (laughs)… Mayonnaise. I just love it; creamy, soft.. I mean, have you had mayonnaise? It’s an art, just like grilling. BF: Of course not! Grilling makes me tons of money. I mean TONS. Without grilling I wouldn’t have multiple TV shows, award-winning cookbooks and a bitter ex-wife. LP: Are you telling me that grilling contributed to your divorce? BF: Not necessarily. But I’m sure mayo, that’s what insiders call mayonnaise, could’ve saved it. It’s a cure-all; moistens cakes, holds together mayonnaise-based salads, and… dare I say, it’s quite the game changer in the sack. BF: Haha, you’re catching on! I’d say it’s definitely about the eggs. Eggs, eggs, eggs! 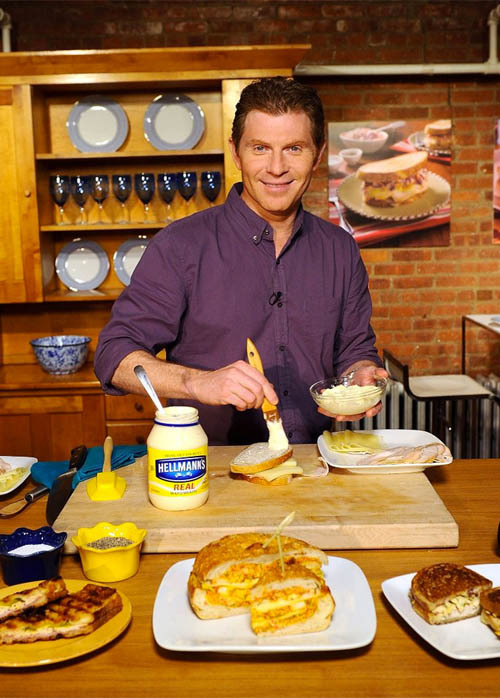 Of course I’d advocate for Bobby Flay’s Cage-Free Eggs for Mayonnaises and Aiolis. We have engineered the perfect viscosity for mayo, plus you cannot beat the flavor absorption of our yolks. LP: So, is there a cookbook in the works? Give me something to look forward to. BF: Oh you can expect the whole Bobby Flay Shabang; merch, cookbooks, spice rubbings! 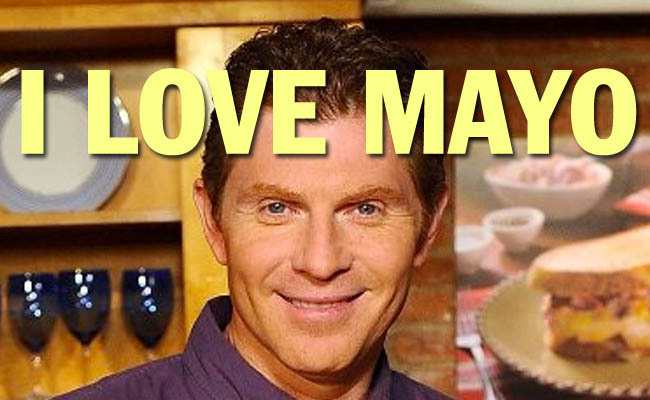 Mayo with Flay’o, Mondays at 8 PM on the Food Network starting this fall. Mayoheads are a huge, untapped market. LP: Wow! You’re keeping busy. BF: I’ve got mouths to feed! Mix all wet ingredients together in a leather bowl, and mix with hands. Add dry ingredients and mash with hand masher until loose. Serve with Bobby Flay’s signature Flat Chested Chicken Tendies, or Flaymoto’s Chinaman Chinese Chicken Crunch Surprise. Freeze or throw away unused portions.